Investing for dividends is an excellent way to participate in the stock market. Dividends represent the sharing of a company's profits with those who hold stock. There are two kinds of stock: common and preferred. Common stock pays no or low dividends; preferred stock customarily pays a dividend on a regular basis. The investment return on common stock is from a hoped-for increase in the company's share price over time. The investment return on preferred stock is a combination of current payment of dividends as well possible long-term increase in share price. An investor may purchase individually owned shares of companies which pay dividends. Or, an investor may purchase shares of a mutual fund which has the objective of owning dividend-paying stocks. The latter is generally considered a more conservative approach since your investment risk is spread out among the larger number of companies in the portfolio. 1. Dividends create a source of cash for re-investment. There is a continuing stream of cash created by dividends. 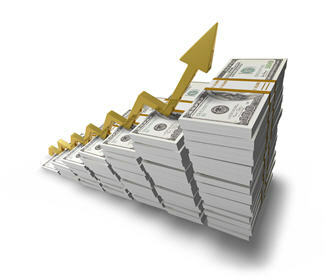 Re-investment of the cash in the purchase of additional shares is a great way to grow your portfolio. 2. Dividends create a source of cash for monthly income needs. At some point in your life, you will need income from something other than work. Having a flow of dividend income is a wonderful way of planning for your economic freedom. 3 Dividend investing benefits from dollar-cost-averaging. Constant re-investment of dividends over time creates an average cost basis. The theory is, that through continuous purchasing of shares, the average cost will be lower than the current price. 4. Dividends offer a source of earnings in a down market. Investor frustration and fears rise during a market decline. Dividend investors can take solace from the fact that there will be profits from their portfolio during the downturns. 5. Dividends pay you profit now. For many people, receiving money right now as profit on their investment is more comforting than waiting for the share price to rise. "A bird in the hand is worth two in the bush," is an adage you can apply to dividend investing. 1. Dividend income is subject to ordinary income tax. Every year investors must pay income tax on dividends from stocks held less than one year. For stocks held longer than one year, the capital gains rate applies, fifteen percent for those people in the upper tax brackets. 2. Dividends are not a guaranteed payment. Dividend payments are subject to change. If the business of a company is not as profitable as it once was, the company may choose to lower or suspend dividend payments. The risk that any one company may have poor results may be lessened by diversification. 3. Dividend investors may not make as much profit on share price increases as common stock investors. Since dividends are a recognition and payment of profits, dividends are part of the company share value. With a common stock, most--if not all--of the share value comes from a rise in market price. Some investors believe that there is a greater potential return from common stocks. However, there may also be a greater market risk. 4. Dividend-paying stock prices may go down when yields rise in the market place. Companies that pay dividends compete with other investment choices. The dividend yield can be an attraction. However, when yields generally rise and investors can get higher yields elsewhere, the yield of a lower-than-market dividend may be offset by a lowering of share price to make up the difference. As with any investment, you would do well to remain vigilant in assessing factors which affect the value of your portfolio. Take an interest in how your investments work. You will be more at ease in knowing what to expect.